While the 0350TSST may look wilder with a bold tiger stripe blade, it has all the durable build and precision quality as the original ZT 0350. The 3.25” blade is made of S30V stainless steel, known for its durability and corrosion and wear resistance, and finished with a tiger-stripe Tungsten DLC (Diamond-Like Carbon) coating. More than blade camouflage, the DLC coating offers extra blade hardness and friction reduction and partial blade serration gives extra cutting versatility, slicing through tougher and more fibrous materials with ease. Opening is quick and easy with the patented SpeedSafe assisted opening system when a simple pull back on the flipper provides lightning fast one-handed blade activation. The blade is paired with matte black, textured, G-10 handle scales for excellent gripping power and mechanical strength. A locking liner secures the blade open during use. 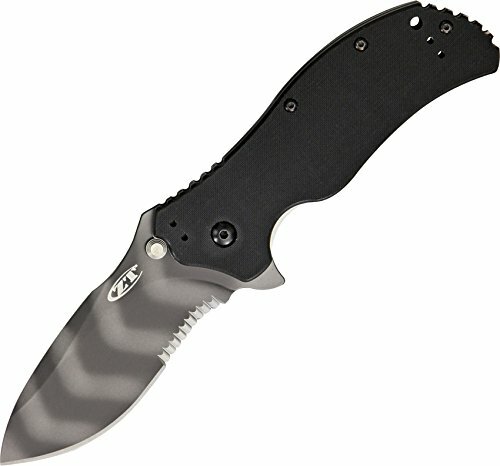 The 0350TSST also includes ZT’s quad-mount system and pre-drilled lanyard hole for complete carry versatility.